Now that we have successfully set up a data source that ColdFusion can connect to, we can perform queries to access data located within the database. To perform these queries we are going to use the <cfquery> tag. 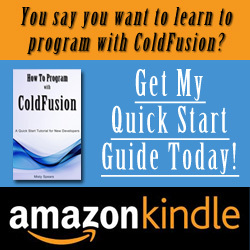 In ColdFusion, everything is done under the hood for you. You do not need to declare any connection objects, strings or recordsets. Instead, you simply wrap your SQL statement inside a <cfquery> tag that you will provide a name value for and a data source (that you created previously). As you can see, this is a much less complicated way of accessing a database and doesn’t require you to remember the many steps required in other languages. In the above example, we have selected all the data from the table without any filter or criteria to be processed. If we want to retrieve data that meets a specific criteria, we would use a standard SQL WHERE clause to pass a certain condition to the recordset being returned. Using ColdFusion, we can take advantage of filters on a dynamic level and filter recordsets based on a user specified selection. For example, if instead of returning all the course names for all courses, let’s only return the course name for the record that has a courseid of “2”. Now for the dynamic aspect. This time let’s pass the value of courseid as a variable from a previous page. This time we would pass the value as a variable to the query. As you can see by the above SQL statement we have now created a filter for the recordset that can be changed depending on the value that you pass to it. Now that we have sent the query to our database and it has sent us back a recordset, we need a way to display that data to the user. ColdFusion makes this incredibly easy with the <cfoutput> tag. You should remember this tag from the previous section on variables, only this time we will be passing an extra parameter to it to display our data. In the query we showed above, we passed a “name” to the cfquery tag and called it “GetCourses”. We are going to pass this same name to the <cfoutput> tag through the query attribute. As you can see from the code above, we are using the <cfoutput> tag to loop through our returned recordset and are using the “#” sign around each column name just as we did when we were displaying the values of variables. There may be instances where using the <cfoutput> tag isn’t practical to use to output the recordset to the user. For example, if you are already using the <cfoutput> tag to do other processing, you can’t put another <cfoutput> tag within it. In these cases, you can still output results within a <cfoutput> tag by using the <cfloop> tag. The best part about using the <cfloop> tag for queries is that the syntax isn’t all that different from the <cfoutput> tag. The important thing to remember when using <cfloop> is that because you are using “#” signs around variable names to display to the screen, they must reside inside of a <cfoutput> tag. How to Create a ColdFusion Data Source – Tutorial!